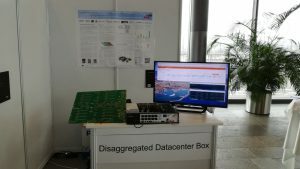 dReDBox had its dedicated booth at the expo of the Design, Automation and Test in Europe (DATE) 2018 conference that took place this year in Dresden, Germany. The innovation pursued in the project and the demonstrated artefacts attracted a lot of interest and discussion from attendees. Dimitris Syrivelis (IBM Research – Ireland), Christian Pinto (IBM Research – Ireland) and Marti Torrents (Barcelona Supercomputing Center) at the dReDBox booth. The dReDBox presence at DATE 2018 was capped with a paper presenting the progress achieved by year 2 of the project, followed by a fruitful discussion on open issues and new ideas forward. 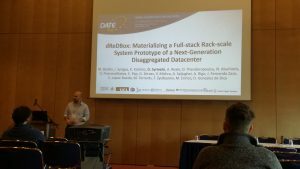 Dimitris Syrivelis (IBM Research – Ireland) did deliver the talk on behalf of the dReDBox consortium.